If you're a regular here, then you probably already know that I am trying to lose weight. It's been an on again, off again struggle for the past several years. But that's not really the point of today's post, except to say that I've been eating A LOT of salads. Big salads for lunch. Smaller salads to accompany our main course at dinner time. Some nights salad IS the main course! The main reason all of these salads, day in and day out, haven't gotten boring for me is because of the toppings. Later in the week, I will show you my favorite salad! Mmmm! I was first introduced to Aurora Natural Salad Fixin's at a family barbecue a couple of years ago. In addition to the traditional barbecue foods, my mother-in-law also made a big salad with a bowl of Salad Fixin's on the side. I went back for seconds just so I could enjoy the crunchy mixture of toppings! I had never seen anything like this in the salad dressing aisle at the supermarket before, so I assumed she put the mixture together herself. When I asked her about it, she showed me the bag and told me she picked it up at her local bulk warehouse market. It took me a while to pick it up since we didn't have a membership to that particular warehouse store. But finally, a few months ago, while shopping with a friend, I picked up a bag and was hooked! No more boring salads! I found myself looking forward to the Salad Fixin's so much that I started to eat salads twice a day just as an excuse to enjoy the yummy toppings! As I noticed I was starting to get low on my bag of fixin's, I started using smaller portions to make it last since I didn't know when I was going get a chance to pick up another bag. Stupidly, it never occurred to me to check and see if the company had a website or online store. I was pleased to discover that they do and I'll be placing an order in the very near future! I was also pleased to discover a very large line of all natural and organic products. 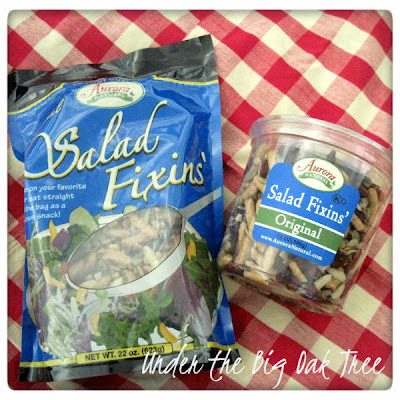 In addition to the Salad Fixin's shown above, Aurora Naturals also packages dried fruits, nuts, trail mixes and granolas. These items are all natural. No preservatives. No artificial colors. No additives. Great, right?! Check out their About Us page on their website to learn more about this fabulous company. It's been a long time since I've been this excited about a food product. Seriously, I love food...I didn't get to be this fat without loving food...but it's been a really long time since I've tried a product and LOVED it as much as I love the Aurora Natural Original Salad Fixin's! It's by far, my favorite thing to add to a salad and it tastes great on it's own, too! While checking out the Aurora Natural facebook page, I read that one fan munches on Salad Fixin's instead of popcorn while at the movies! Now that's a great idea! 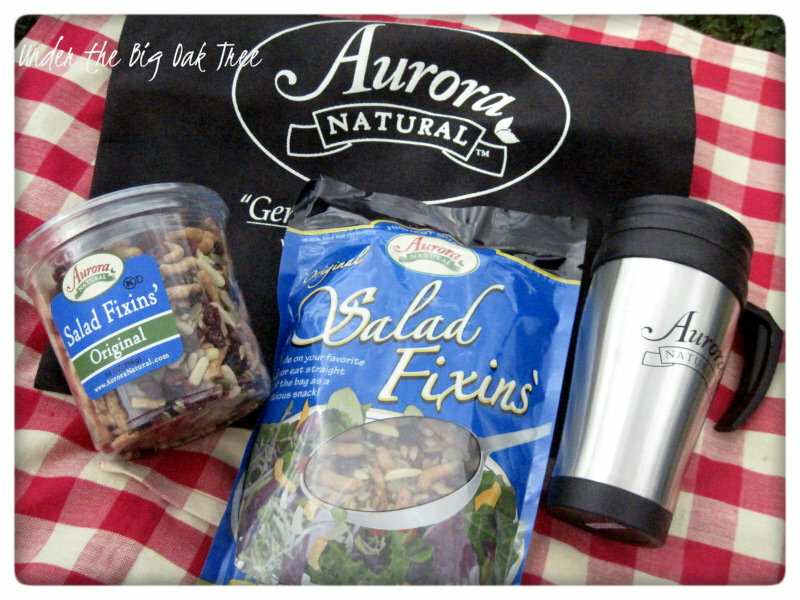 Recently, I was very excited to receive a gift package of Original Salad Fixin's and a couple other goodies from the nice people at Aurora Natural. I'm even more excited to be able to give one away to one lucky Under the Big Oak Tree reader! One 22 oz. resealable bag of Original Salad Fixin's. One 14 oz. plastic tub of Original Salad Fixin's (great to keep in your desk at work). One Aurora Natural reusable tote bag. One Aurora Natural travel mug. Visit the Aurora Natural website and leave a comment here on this post about something you learned about the company and/or their products (something different than what was mentioned in this post) or let me know which of their products interest you. LIKE Aurora Natural on Facebook (let them know that Under the Big Oak Tree sent you) and leave a comment here on this post letting me know you did. FOLLOW Aurora Natural on Twitter (let them know that @thebigoaktree sent you) and leave a comment here on this post letting me know you did. Enter our Butch's Lip Smacking BBQ giveaway and leave a comment here on this post letting me know you did. LIKE Under the Big Oak Tree on facebook (there may be ways to earn additional entries posted there throughout the length of the giveaway) be sure to leave a comment here on this post letting me know you did. Your comments are your entries into this giveaway. Please remember to leave a separate comment AFTER completing each task. Of course I entered your Butch's Lip Smacking BBQ giveaway! YUM! The Aurora website was down, and I was not able to chose a product. I pearned the salad fixins are vegan! Awesome giveaway!! I learned they only had 4 employees in 1998. I liked Aurora on FB and told them you sent me!